A fab car – and with flowers! I don’t think you can sew with this. 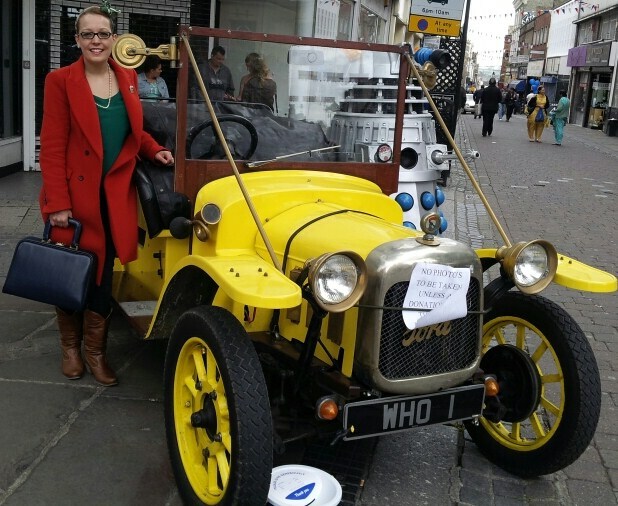 I did manage to get a picture with one car which I was told was a life size model of the car used in Doctor Who. It was yellow, that’s as far as my knowledge on that goes! This Saturday adventure allowed me to continue the habit I developed of asking people to take pictures of me with vintage cars, even when I cannot drive myself (something which my wife despairs about). As far as I see it doesn’t stop me loving a vintage car or making use of the chance for a photo op. I like to think of myself a bit like Lady Penelope from Thunderbird’s but not sure how the wife would feel about me calling her Parker! What a great little find this weekend at Gravesend, our very own version of ‘Goodwood’. Now I just need to get those driving lessons booked so I can own one of these cars in years to come and get pictures of me inside! The thing is what does one wear to learn to drive?